"TOH (Top Of The Hour)"
"TOH (Top Of The Hour)" is the station-assigned name of an untitled track by Nine Inch Nails, written exclusively for Shinya Tsukamoto, to be used in an MTV Japan promotional placement. It has never been released, and is only found within the trailer itself, posted on YouTube. So far, a number of famous film-makers have made the TOH in the US. This time - exclusively for MTV Japan - Nine Inch Nails, who had been asking Tsukamoto to do their promotional video, penned the music. 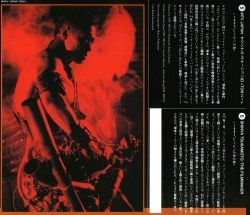 With this familiar melody [sic] by NIN, the video almost feels like a scene from the movie Tetsuo. The film won the Station/Network ID award at New York Festival 1994. [The copywriter fails to mention "who", but somebody] attended the ceremony and got tumultuous applause. This page was last modified on 10 July 2015, at 16:51. This page has been accessed 24,442 times.